Lots of stuff has been going on in my life, lately. Lots of thoughts are bumping around in my head. Lots of things I find that I have an opinion on. So, here I am thinking I should probably find a way to get them out of my head and make room for some new stuff….aaahhh – the therapeutic nature of the blog, or should it be called a “brain dump receptacle”? 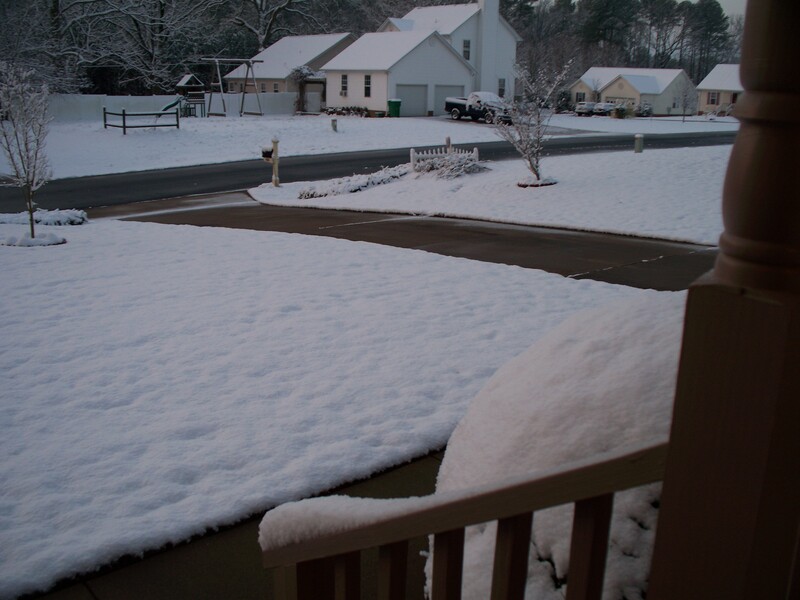 First — the most recent update is that WINTER is STILL attacking Sanford, NC! We typically get one sign of snow a year – sometimes barely noticable, sometimes quite problematic, always a source of great excitement for the area. We usually get more ice and winter mixes than actual snow. This year – the first since I moved here in 1985 – we had three major snow events and a couple more minor showings. If I kept count accurately, there were five instances of snow in some capacity since January, 2010! So – January, February, and March all had a major snow event. March? Seriously? This is the time of year I’m usually tormenting my northern friends with emails about how spring is starting to show up! 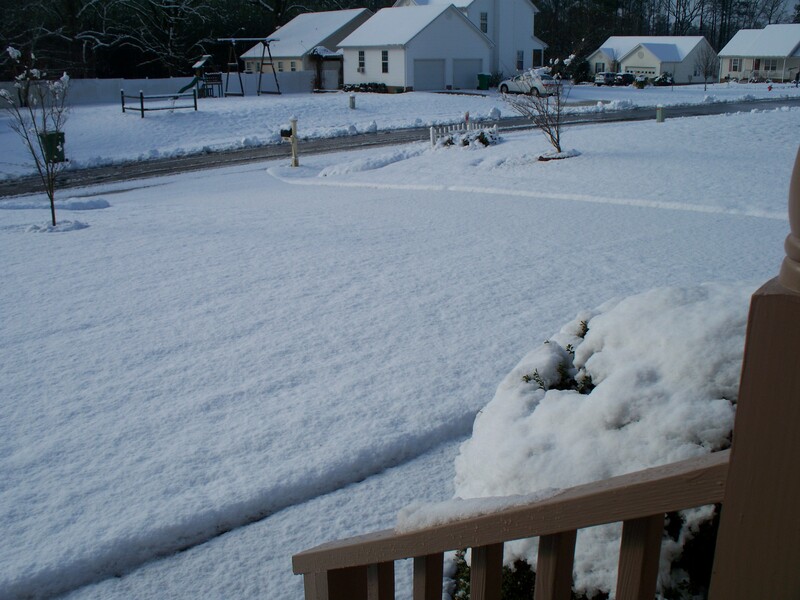 Here are some pictures depicting the 2010 winter season in Sanford, so far…. This is the same shot taken of all three snow days. 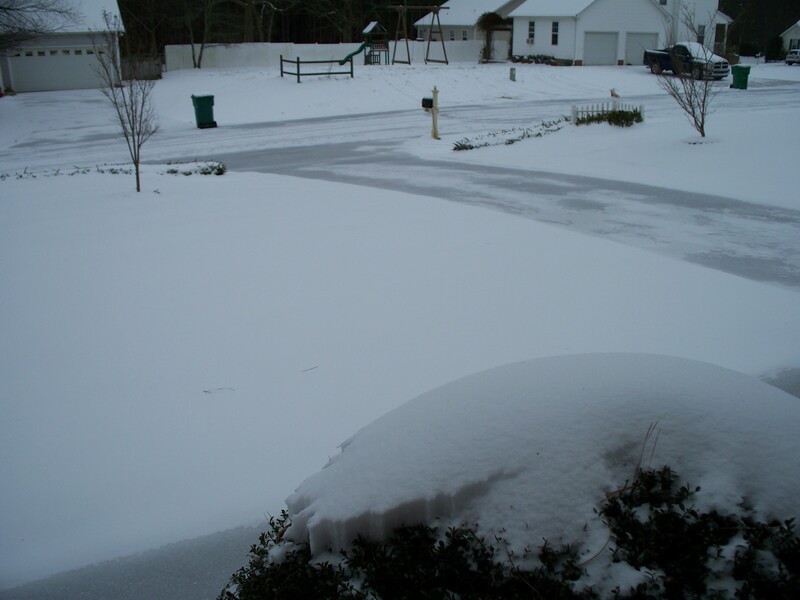 The first was in January – we got a heavy mix of snow and ice – my driveway was a thick sheet of ice! The middle was in February – it came down light and fluffy, didn’t stick on the pavement, and was gone by mid-day! The last was March – today, in fact – it is very wet and heavy and completely covered everything, but is already melting away! I didn’t get as much as parts of the county west of me, though! Next is a follow-up to last week’s post about being stressed about some upcoming outpatient surgery I was scheduled for this week. It happened yesterday and I am not really sure why I was so stressed out! It was really a piece of cake. I wasn’t totally unscathed, but it was definitely not worth all the worry I invested into it. I have to say I had a very good experience at Central Carolina Hospital — the nurses were so nice and helpful, the anesthesiologist was also very nice, informative, and caring! As promised by the anesthesiologist, they started with a little something to relax me and by the time I got into the operating room, the last thing I remember is scootching over onto the table. The next thing I knew, the nurses were calling my name and telling me to breathe deeply to wake me up in recovery! I have no idea what happened in between that and, quite frankly, don’t really care! They warned that I would likely be weak, tired, and woozy most of the day. They also warned that I might have somewhere between mild and extensive cramping and to take pain meds to control that. I got home, had some lunch, and went to bed. I spent almost all day and then all night sleeping! I got up a few times and tried to stay up, but just wasn’t up to it – very light headed and fairly lethargic. But, the cramping never happened – I had some twinges and hints of cramping a few times late last night, but nothing else! Ronald was there through the surgery and stayed with me all day – he was very supportive! Lisa came over after she finished with some commitments she had during the day and was very helpful. Today, I am up, but still somewhat light headed and after being up for about 4 hours, I think I’m ready for a nap! The funny thing of it all is the instructions for my first 48 hours: Do not drive a car, use power tools, ride a bicycle or climb a tree! Hhhhmmmm – guess I’ll just have to put off my plans for today to ride a bike to the nearest big tree, climb to the top and use power tools to trim the limbs and build a tree house – then drive my car to haul off the debris! Tomorrow, I’ll be back to work and ready for all that life has to offer! I go back to the doc in a couple weeks to find out about the biopsy and get checked out. I’m very optimistic! Now — on to the announcement of the upcoming new season of Dancing with the Stars: Come on! Last season was fairly lackluster and blah….I hoped that would pick up this year. Guess not — maybe this show has run its course and they are stretching at straws trying to find appropriate stars – problem is, it isn’t working! Did they really think Kate Gosselin and Buzz Aldrin would be good choices? And the Batchelor guy??? Really??? OK, so Aiden Turner from All My Children just might give me a reason to tune in, but we’ll see if watching him is enough to overcome having to watch the rest…….it doesn’t sound too promising! Fundraiser updates: February brought us two – count ’em – two very successful CARA fundraisers!!! First Friday at Cafe 121 on Feb 5th was the most successful event since Chef Hamm started hosting these events for local non-profits. Out take for the evening was $1000 and it was so much FUN!!! Then, on Feb 22nd, we had our third annual Bella Dinner benefiting CARA’s Holly Fund (fund maintained to provide care for homeless animals with special health or developmental needs) held at Bella Bistro. This, too, was a fabulous event – fun, great food – 5 course gourmet dinner with wine pairings and a champagne reception – and lots of wonderful conversations with fellow animal lovers! Our proceeds for that event was about $3300! So – in one month and two amazing events, we brought in over $4000! What a great month! The next CARA event is “Ride for Their Lives” – a biking event at Deep River Park at Camel Back Bridge on May 8th. AND — drum roll, please — at Communities in Schools of Lee County are starting to get into the bulk of the plans for this year’s “Dancing with the Lee County Stars” event scheduled for August 13th! It is going to be even better than the hugely popular first event last year! !